Daniel Drezner, incredibly, wants Mikhail Saakashvilli, currently President of the Republic of Georgia, to be President of the United States. The reason is that Saakashvilli has reduced corruption in Georgia and decreased the size of its government. Drezner must have missed recently the part about Saaksvhilli doing his very best to start a war with Russia. Some background: after the breakup of the Soviet Union, the regions of South Ossetia and Abkhazia have been de facto independent of Georgia. Although grouped with Georgia within the Soviet Union, they are ethnically and culturally different and refused to become a part of Georgia after communism ended. A bloody civil ensued, ending with independence for these regions in '93. Saakashvilli has repeatedly said that he will re-integrate Abkhazia and South Ossetia into Georgia, by force if necessary - which has brought him into conflict with Russia which wants the regions to remain independent. Recently, Saakashvilli has began a small quasi war with South Ossetia. There are reports of brutalities committed by Georgian troops. The conflict has create a tense standoff in the region, with everyone guessing about the extent Russia will get involved. Incidentally, Saakashvilli has ordered Georgian border patrol to shoot Russian tourists going to S. Ossetia and Abkhazia; members of the Russian parliament on a tour these regions have been fired on by Georgian troops. Thanks, but I'll stick with Kerry and Bush as far as my choices are concerned. Don't just go and keep on talking; you've got to do a little listening. You're not a very good listener. A screenshot from Arab Pop Idol, one piece of western culture I am not so keen on exporting. 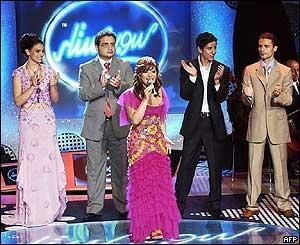 The finalist on the right, Amar Hassan, is said to have performed a song with Qaddafi recently. Qadaffi, incidentally, has reportedly wondered if Hassan's victory would not have the unfortunate effect of distracting the Palestinian youth from the Arab-Israeli conflict (Hassan is Palestinian). Scanned this from a magazine (click on the picture for a bigger, clearer version). Curious! Note that she is holding a book in her right hand, instantly recognizable from the colors to be one of the Oxford World Classics series. Is this the new look? Smart models who read? On the other hand - and this is blurred in the scanned version above - the book she is holding is, on closer inspection, Riders of the Purple Sage by Zane Grey - an anti-Mormon screed from the early 20th century. It is the story of a lone woman in Utah struggling against the tyrannical, cruel elders of the church who want to forcibly marry her off, rescued in the end by an infamous Mormon-killing gunman. I'm guessing not many Mormons shop at sundance anyway. ...there is a significant lag between the reporting of good economic news and the internalization of that news by Americans. Earlier this month, an Associated Press poll found that 57 percent of respondents believed the nation has lost jobs in the last six months, even though 1.2 million jobs had been created during that span. The data does not demonstrate what Drezner thinks it does. According to the CIA World Factbook, the US population grows at 0.94% per year. Thats about 2.7 million people per year. Job growth of 1.2 million jobs per 6 months actually trails population growth. Now Drezner is right of course that the absolute number of jobs has increased. But people's perception of the labor market tracks how difficult it is for them to find a job, which depends on how many people compete for those jobs; not simply the absolute number of jobs. Given that job growth has trailed population growth, the reason people have not absorbed the good news is that there aren't any. 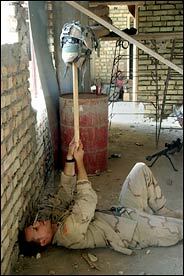 A US soldier tries to draw enemy sniper fire in Najaf by holding up a helmet on a stick. From today's Times. Imagine what conservatives would be saying if John Kerry did the things President Bush has done this year in Falluja and Najaf. Here's a little refresher. On March 31, four American contractors are murdered in Falluja, their mutilated bodies dragged through the streets. American officials pledge to retake the city and bring the killers to justice. On April 5, 1,200 Marines encircle Falluja--digging trenches and blockading roads. After two weeks of sporadic fighting in which 36 Americans are killed, the United States halts the siege--on the condition that the militants hand over their heavy weapons. When they don't, the United States extends the cease-fire, despite insurgent attacks. Finally, on April 27, the Marines prepare for an all-out assault. U.S. planes drop flyers reading, "If you are a terrorist, beware, because your last day was yesterday." Lieutenant Karl Banke, a platoon leader with the 1st Battalion, 5th Marine Regiment, tells The Washington Post, "Every one of them [in his platoon] has a hunger deep down inside to finish the job. We've now shed our blood in the city. The last thing we want to do is walk away." On April 29, the United States walks away. Taking senior military officials by surprise, the White House orders the Marines to pull back from the city, which will be patrolled by the Falluja Brigade, a roughly 1,000-man force composed of Saddam Hussein's former soldiers. The force is supposed to disarm the militants. In early June, the Post's Daniel Williams slips into Falluja and reports that, while the "brigade stays outside of town in tents, [and] police cower in their patrol cars," masked militants "[pull] cars over at will." The insurgents impose sharia on the city, banning the shaving of beards and parading alcohol venders naked through the streets. Terrorists flock to Falluja--using it as a base from which to launch kidnappings and attacks. Asked on June 17 about conditions in the city, Deputy Defense Secretary Paul Wolfowitz tells the Post, "We're making progress." If John Kerry, or Bill Clinton, had done all this, conservatives would be apoplectic. Falluja and Najaf would be exhibits A and B in their case that Democrats lack the toughness, and moral fiber, to protect America. Here's a prediction: if Kerry gets elected, the Weekly Standard and the National Review will miraculously rediscover the "sensitive" policies employed by the U.S. military regarding Sadr and other insurgents. We will be treated to an array of articles - some of which will seep into the national media - documenting how we are losing in Iraq due to our reluctance to take on the terrorists. When you say "so called X," you mean to say that while it is being referred to as X, its really not X. That is, a "so-called disengagement plan" is something that is billed as a disengagement plan but is really not. After all, reporters usually don't refer to the "so-called state of the union address." Which raises the question: in what sense is Sharon's plan anything other than a disengagement plan? Given that it calls for withdrawing Israeli settlers from Gaza, how is the label "disengagement" inappropriate? ...Palestinian's intifada approaches its fifth anniversary and shows no sign of abating. More than 2,700 Palestinians and about 980 Israelis have been killed in the conflict. In fact, the number of terrorist bombings has dramatically decreased - by 75% in the last year and even more since the peak of the intifada in March 2001. Perhaps I am nitpicking on the "so-called" but the Post is factually wrong in claiming that the intifada has not abated. Errol Morris' new Kerry ads done for MoveOn.org make for fun watching, as well as Morris' earlier, similar series for Apple. This one, I thought, was a particularly candid ad for Democrats to make. Last week a federal panel from the Ninth Circuit Court of Appeals ruled that trial judges in western states can sentence convicts to be publicly shamed. After ordering Shawn Gementera to serve time in prison for stealing some letters, a San Francisco judge required the offender, as part of his supervised release conditions, to stand outside a local post office wearing a sandwich board that said, "I stole mail. This is my punishment." Perhaps we should have a public flogging while we are at it. An unabashed racist won the Republican nomination for a House district in Tennessee earlier this month. James Hart, who contends that whites should not mix with "less favored races," thumped a Republican write-in candidate -- 7,865 to 2,061 -- to win the party's nomination for the state's 8th Congressional District. "The poverty genes of less 'favored races', which are spread by welfare and immigration, are destroying our cities no less than if they were hit by a nuclear bomb," Hart said on his campaign Web site. "Unless we stop dysgenic welfare and immigration policies, the U.S. will look like one big Detroit." The state GOP, which was unable to find another candidate in time for the election's filing deadline, has disowned Hart's campaign, calling his views "outrageous." The district, which is represented by Rep. John S. Tanner (D-Tenn.), is considered Democratic country. But Hart's candidacy will nevertheless give him a platform for his views and the Republican Party a headache. Meanwhile, Cynthia McKinney, a Democrat who claimed that Bush knew of the 9/11 attacks in advance but refused to stop them so that his friends could profit from them, won back her old House seat recently. "I'm asleep, Stephanie," O'Reilly interrupts. He looks around the circle. "Give me something I can put on the air, please." A producer tosses out an idea about a doctor who recommends giving pot to kids with attention-deficit disorder. O'Reilly's eyebrows lift into two sharp points. "Can we get the doc?" he snaps. O'Reilly loves any story that smacks of child mistreatment. There's easy emotion in it, and what O'Reilly is always looking for is emotion, something to jolt his viewers, to stir them to an indignation, disbelief or contempt equal to his own. His nose for such stories, and his ability to milk them for every ounce of drama, is what has made him the most successful personality on cable news. He demonstrates his special skills a few days later, when he kicks off The Factor with a tale of two U.S. soldiers who fled to Canada rather than serve in Iraq. Next to stories about abused kids, nothing pushes O'Reilly's buttons like stories about lily-livered, spineless, cowardly, anti-American lowlifes like these two deserters. He brings on a guest to "discuss" the "issue": Toronto Globe and Mail columnist Heather Mallick, who has dared to call the two deserters "fine American men." O'Reilly is not happy. And from the top of the "interview," he strikes that special note of scathing, keening contempt that might be described as the keynote of the entire Fox News Channel, an operation whose professed reason for being is to counterbalance the supposed liberal bias of all other media outlets. Thus the mood of bunkered aggrievement, which animates even the network's ostensibly "objective" news shows and which O'Reilly has raised to the level of an art form. "I don't think for a moment such a boycott would take place," says Mallick. "We are your biggest trading partner -- "
"No," O'Reilly cuts in, "it will take place, madam. In France -- "
"I don't think that your French boycott has done too well -- "
At which point O'Reilly executes his signature move -- the bellowing, bullying, peremptory interruption. "They've lost billions of dollars in France, according to the Paris Business Review!" he thunders. In short, amazing TV -- the modern media equivalent of witnessing a Christian torn apart by lions, with a touch of opera buffo thrown in. (Boycott Canada?) It mattered not that most of what O'Reilly said bears no relation to the truth. The Paris Business Review doesn't exist, and the "billions" of dollars France supposedly lost reflect figures dating to the 2001 recession, predating by two years O'Reilly's call for a ban on buying French goods (since then, French exports to America have actually gone up). Does the President support a minimum wage increase? -New jobs are being created. The economy has added over 1.5 million jobs since August. The President is focused on policies that will keep the economy growing. -The Administration will continue to work with Congress to study the various minimum wage proposals. I can understand dodging a question you're asked by a reporter, but if you don't have an answer, why in the world would you put the question on your website? A political ad in Venezuela, urging a vote against Hugo Chavez. You hit me, I'll hit you. Even if it does look like he hasn't eaten in a while. Barkley added that he was worried that Coimbra might pull a spear on him (source). Given that a couple of weeks have passed, lets look back at the terrorist alert of Aug. 1st. This is incredibly flimsy evidence to base a terror alert on. But nevertheless, this is what the administration did. It seems difficult to ignore the timing of this: Aug 1st, the day after the Democratic Convention ended. It seems difficult to ignore the politicized way in which this was done, with Ridge mixing alert warnings with paens to the President's role in the war on terror. It seems difficult also to ignore that most of the measures taken to protect NYC - tunnels closed, streets cordoned off - are gone by now, two weeks later. It should be noted than in an effort to justify its actions after August 1st, the administration unmasked our mole in Al Qaeda, hurting our ability to infiltrate the organization. I don't mean to suggest that this was a purely political action. I do mean to suggest that it was handled in the incompetent and blatantly politicized way thats typical of this administration. Marvel Comics and Gotham Entertainment are launching an Indian version of Spiderman, where Peter Parker is "Pavitr Prabhakar". During a visit to meet Filipino workers in Kuwait last year, one of [Phillipine President] Arroyo's female bodyguards shoved away a man who approached the president with his lips puckered and ready to plant a kiss on her cheek. A picture of the man's foiled advance was published by many local newspapers. The presidential palace then announced that no one should ever try to claim a smacker from Arroyo, who is always protected by her troop of bodyguards. 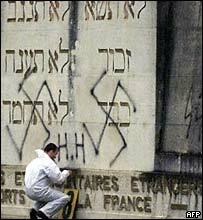 The latest desecration of Jewish graves in France today. I suppose it has gotten common enough that it doesn't make the U.S. news anymore. Alan Keyes kicked off his campaign mixing identity politics with radical conservatism by claiming that being against abortion is the same as being for slavery. No, it really happened. Really. HANNITY (8/10/04): One thing we do know is John Kerry admitted that, quote, “I committed atrocities.” He said that. He admitted he burned villages. Let’s take a look at one of the tapes where he did this. KERRY (videotape, 1971): I personally didn't see personal atrocities in the sense that I saw somebody cut a head off or something like that. However, I did take part in free fire zones. I did take part in harassment and interdiction fire. I did take part in search and destroy missions, in which the houses of noncombatants were burned to the ground. And all of these, I find out later on, these acts are contrary to the Hague and Geneva conventions and to the laws of warfare. So in that sense, anybody who took part in those, if you carry out the application of the Nuremberg principles is, in fact, guilty. HANNITY: All right. Mr. Johnson, let me ask you this question. He admits—quote, his quote, “I committed atrocities.” He said, “I burned villages.” Here's the point. He made Vietnam an issue in this campaign. Should we pursue answers to the questions of what atrocities he committed, why did he burn down villages? Conservatives have long argued that most international aid does more harm than good due to its inevitable politization. When food and medecine is shipped to countries controlled by ruthless dictators, like North Korea, it typically gets disbursed through the local power structure of the dictator. This strengthens the dictator's control and influence; it also helps many dictators stave off famine and avoid the fruits of their mismanagement. International aid organizations have historically rejected this argument. Which is why I was so surprised to see an article in Slate today documenting a prominent aid organization - Medecins Sans Frontiers - stopping the provision of aid because the host country had made it too politicized. That country was...wait for it...the United States. And that leads to what may be the more important reason for MSF's departure: the perception that humanitarian aid is being politicized in Afghanistan. MSF stated that "the violence directed against humanitarian aid workers has come in a context in which the U.S.-backed coalition has consistently sought to use humanitarian aid to build support for its military and political ambitions." For months, aid workers here have complained that the military is encroaching onto their territory and blurring the line between military and humanitarian action. Particularly nettlesome are the Provincial Reconstruction Teams that the United States, Britain, and NATO have established. These teams blend security and reconstruction work in a way that is troubling to humanitarian purists. But it's not just the PRTs; it's also the SUVs: Some coalition soldiers have taken to driving around the country in white Toyota Land Cruisers, aid agencies' vehicle of choice. It's a practice I never witnessed in the Balkans, and the humanitarian community's discomfort is understandable. And then there were the leaflets. Apparently, U.S. forces dropped flyers in the southern town of Spin Boldak suggesting that humanitarian aid might not continue unless the population helped turn over opposition forces. I'm sure these concerns are well founded. But MSF functions in countries like North Korea, Uganda, and Burma where their aid is politicized by corrupt dictators. I find it interesting that they withdraw from Afghanistan when the U.S. begins to misuse aid, while it never bothers them when Kim-Jong Il does it. Is this plain anti-Americanism or what? Due to a glowing recommendation from Bill O'Reilly, I've added Media Matters to the permalinks. Members of the media - I keep seeing the same story line all over the news: Democrats are all lined up behind Kerry with no dissent, but wait, Democrats are anti-war, Kerry is not anti-war, Democrats are for gay marriage, Kerry is not for gay marriage, ergo Democrats really, really hate Bush, are not enthusiastic about Kerry, and have all agreed to keep mum about this in order to win. This would be convincing if Kerry were foisted upon the Democrats by a group of men deliberating in a smoke-filled room. But Kerry is there because, um, people voted for him. You know the Democratic primaries? Where people vote for their nominee? Democrats could have chosen Dean who had plain anti-war appeal. They could have chosen Lieberman if they wanted a pure centrist. They could have chosen Edwards if they wanted a smooth-tongued advocate. But they chose Kerry. They chose him because... I don't know why. But they chose him. The idea that they'd rather have someone else is just plain silly - can we please stop inserting it into the news? We [at Fox News] put more liberal voices on the air than conservatives. Bill O'Reilly, during a recent debate with Paul Krugman, claiming Fox News is a liberal network. ...the real decision about who will be elected president in October, and elected to Parliament next spring, will probably be made at meetings taking place right now in guest houses around town, where heavily armed guards idle outside near S.U.V. 's with tinted glass. Inside, men who command thousands in their own private armies, some of them veterans from the wars against the Soviet Union and the Taliban, are deep in discussion. Will they back Mr. Karzai, who has vowed, with American and international backing, to disarm them and build a unified national defense corps? Or will they form new alliances in opposition? Whichever way they choose, their soldiers, or mujahedeen, and their local communities are likely to follow their instructions at the polls. That means that Mr. Karzai may not be the shoo-in he was thought to be, unless he works out a deal with the regional commanders and governors who have become his single biggest challenge as he tries to maintain power and build democratic institutions. If the goal really was, as President Bush is fond of intimating these days, the creation of a free democratic state in the Middle East, clearly we would have been better off working to create a democracy in Afghanistan; instead we had rushed headlong into Iraq and ended up with two parallel uphill battles to fight. If thats what passes for "leadership" these days we are truly living in an age of low expectations. 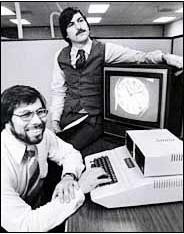 Steven Wozniak and Steve Jobs in 1980. I don't know much about fashion but I doubt this was in style back then. This provision that has supposedly generated anger across party lines: didn't Republicans pass it recently in a pure party-line vote? Memo to the New York Times: look up "across" in the dictionary. I always said that Saddam Hussein was a threat...He was a threat because he had terrorist connections, not only al Qaeda connections, but other connections to terrorist organizations; Abu Nidal was one. He was a threat because he provided safe haven for a terrorist like Zarqawi who is still killing innocents inside of Iraq. Q: There's also al Qaeda in the United States. That does not mean the United States is cooperating with those members of al Qaeda. Just by the presence of someone does not mean there's a cooperation. ...there was the case of Orlando Bosch. Bosch was a Cuban exile, a former pediatrician who had served time in prison in the United States for conspiring to plant mines on foreign vessels and for firing a bazooka at a Polish freighter docked in the port of Miami. In 1976, Bosch was arrested in Venezuela and convicted of masterminding the bombing of a Cuban airliner. All seventy-three people aboard were killed. Bosch was still in jail in Venezuela when Reich arrived [as Ambassador to Venezuela]. As it happened, Bosch was retried and acquitted six weeks after Reich got to Venezuela. Once Bosch was released, he tried to get a visa to the United States. Reich has always denied taking any special interest in the case. In the diplomatic cables he sent to Washington, according to his spokesman, Reich wrote that he had informed the Venezuelan government that Bosch was not welcome in the United States. But he also appended, in cables that have been declassified, some unusual notes to Bosch's aplications, passing on, for instance, a report that a Cuban assasination team had entered Venezuela with Bosch as its target, and that Bosch's friends would be able to extract him from the country at a few hours' notice. Bosch, however, did not wait for a visa. In February, 1988, he boarded a plane to Miami, tried to enter the country illegally, and was arrested at the airport. The Justice Department, which had connected Bosch with more than thirty acts of sabotage and violence, wanted to deport him. To many Cuban exiles, however, Bosch was a hero - the Miami City Commission had even declared a Dr. Orlando Bosch Day, in 1983 - and there was an intense public campaign to have him freed. Jeb Bush was a prominent figure in the campaign, and in 1990 the first President Bush, ignoring a Justice Department recommendation, ordered Bosch released. Today, Bosch lives freely in Miami. One of the trademark features of conservative blogging is the rhetorical question: "why isn't the media reporting good news from Iraq?" Usually, this is followed by ruminations on the liberal character of the media and on the defeatism and America-hating that characterizes the left. Instapundit regularly provides "good news from Iraq" roundups. Over at Tacitus, a recent post asked why the media was not reporting that "the Iraqi State Board of Antiquities signed a multi-year partnership to jointly develop master conservation plans and training to help conserve Iraq's most endangered and important archaeological and world heritage sites..."
...in Iraq's Sunni Muslim triangle west of Baghdad, the governor of Anbar Province, which includes the volatile cities of Fallujah and Ramadi, appeared on television in the company of men in masks and announced his resignation, a week after insurgents set fire to his house and kidnapped three of his sons. Abdul Karim Rawi, shown on the al-Jazeera cable television network, read a statement saying he "repented" his cooperation with the "infidels." The folks at Tacitus are right, of course: clearly the most important events going on in Iraq center around the Iraqi Antiquities Council. This is enraging: an anti-Kerry political ad claims Kerry lied about the incidents that won him medals in Vietnam and hurt veterans with his anti-war testimony. This is rich, coming from a guy who passed the war far away from combat sitting in planes for the Texas Air National Guard; and a guy who did not go to Vietnam because "[he] had other priorities during that time." Especially considering that, in light of the evidence, Bush didn't even show up for much of his National Guard stint. Formally, the ad was run not by Bush but by an outside group not directly funded by the campaign - an artificial distinction, given that the Bush campaign has refused to condemn the ad. Update: Instapundit complains that Kerry is "suppressing dissent" by threatening to sue over this. But the ad contains some factual claims: that Kerry was not wounded trying to save a crewmate from death, that there was no enemy gunfire during this incident - claims that contradict what Kerry & his gunboat veterans say happened. If Kerry can prove in a court of law that his opponents are lying, he should sue -political dissent does not include disseminating known lies about your opponent. Dan Coates, Republican Senator from Indiana, speaking about Bill Clinton in 1998. From "Scrub In" by Ryan Lizza in TNR.